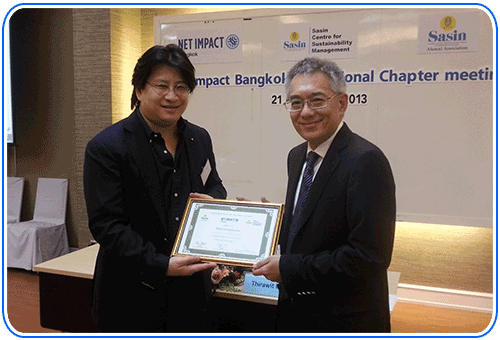 Bangkok, Thailand - Mr. Thirawit Leetavorn (right), Double A Senior Executive Vice President accepts the Certificate of Appreciation from Mr. Nick Pisalyaput (left), Director of Sasin Centre for Sustainability Management (SCSM), at the Net Impact Professional Chapter monthly meeting held at Sasin Graduate Institute of Business Management of Chulalongkorn University. Mr. Leetavorn presented Double A’s ‘Sustainability in Action’ and unique Paper from KHAN-NA program – an attempt to alleviate poverty among Thai farmers by providing sustainable income from growing paper trees along rice paddies. The monthly meeting was attended by CSR practitioners, NGOs, corporate and academicians.